The girls are now 6 months old and quite content with life indoors. They are chock full of energy and personality. HuzBen and I get exhausted just trying to stay out of their way. Posh is still the shy one but she's been coming out of her shell a lot more. She doesn't like to be picked up and held but she isn't timid about walking across your chest and nuzzling your neck if she wants to be petted. 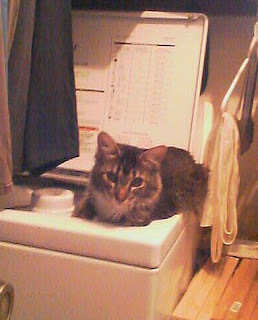 Like her Spice Girl namesake - she loves clothes, specifically she loves laundry and the laundry room. She takes her afternoon naps on the washing machine and more than once I've found her inside it, playing with the coins that are always falling out of Ben's pockets in the wash. Poshy Washy is her latest nickname. A basket of freshly laundered clothing is also a toy box for her. She likes to take out the socks and drag them around the house. She's probably the only cat I've ever had who smells like Tide and Downy. Danica is still the more feisty of the two and the biggest troublemaker. She prefers the bathroom over the laundry. 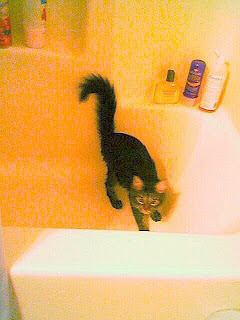 The bathtub is her own private little sports arena. She carries small items like buttons, milk jug caps and her toys into the bathtub and bats them around as they bounce of the sides of the tub. If we are missing something smaller than a golf ball, we usually find it in the tub.